Lessons from Afghanistan: A Curriculum for Exploring Themes of Love and Forgiveness is hot off the presses and ready to be shared. 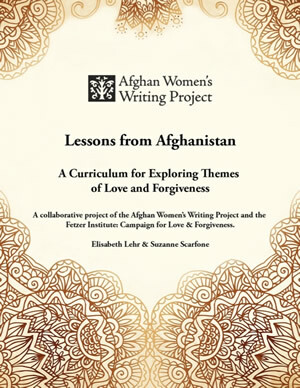 A collaborative project of the Afghan Women’s Writing Project and the Fetzer Institute: Campaign for Love and Forgiveness, we seek teachers, writing group leaders, and facilitators of all stripes and interests who might be interested in exploring the lessons crafted by educators Elisabeth Lehr and Suzanne Scarfone. We provide the curriculum free of charge. The curriculum is divided into five sections that progress from personal definitions of love and forgiveness to the themes of self-love, love of others, and finding forgiveness. The curriculum ends with an optional “capstone” activity designed to summarize the participants’ learning and personal growth. The curriculum is designed to be flexible. Facilitators are free to select sections from the curriculum to create an experience that will most benefit their specific group structures. About the process: AWWP writers were invited to join a “Love and Forgiveness” workshop overseen by mentors Suzanne Scarfone and Rachel de Baere. In our regular workshops, writers were also encouraged to engage these themes. Over six months, writers wrote on specific prompts designed by the mentors to address specific themes of love and forgiveness. The writers mined their hearts and souls thus presenting readers with gifts of beautiful words and deep wisdom from which all could learn. Writing from a nation that has been in violent conflict for over thirty years, these themes proved to be particularly powerful and inspirational to writers, mentors, and staff alike. Our hope is that this curriculum will allow groups of various communities, backgrounds, and educational levels to explore, reflect, and learn about the meaning of love and forgiveness in their lives. Allow us to send you a hard copy or a PDF copy via email. Please send your request to stacy@awwproject.org and the curriculum will be on the way to you soon! Many years ago I was exposed to an Afghani doctor (Shafia, I will keep her last name out) . We were at the home of Dr. Gladys T. McGarey MD., MD (H) known as the Mother of Holistic Medicine. Dr Gladys had just returned from a trip to Afghanistan where she worked with about 50 women about matters of birthing. Dr. Shafia and I became friends, now over five years have gone by, we continue our friendship via emails. The communications, though not regular bring each of us a better understanding of our cultures. The process by which people learn to accept, respect and learn acceptance. The French say Vive La Difference, if only the rest of the world could accept differences. I have a feeling we would have less discontent among people.